John Aldington donated his collected Frazer Nash and AFN possessions to the Archives when it became a registered charity in 1998. At the time, he noted that “the first massive task is to log all the items that are under the Trustee guardianship”, . . . . “thousands of photographs, artwork, race programmes and files on individual cars etc.” What he didn’t mention at the time were also the huge collections of drawings and blueprints and a wealth of original material from the Kingston factory in the late 1920s that was found in the attics of the Isleworth works in the late 1980s. Until very recently, these records, amounting to probably about 10,000 documents, have been largely untouched, still with the accumulated dirt and grime of over half a century under the rafters of the Isleworth plant. The Archives has also benefitted from the bequest of much original material from the family of Archie Frazer-Nash, including awards, photographs and personal diaries. When some years after John’s premature death in 2006, the trustees set about following all his wishes for the charity, the extent of the task became apparent with the realisation that the job of logging really meant archiving. As many of the contents were approaching their centennial, with some fragile and in poor condition, conservation was necessary before the task of sorting, indexing and cataloguing could begin. This coincided with an appreciation of the need to generate a digital record of the contents in the unfortunate event of a total loss, and thus scanning of the most important material started in 2010. 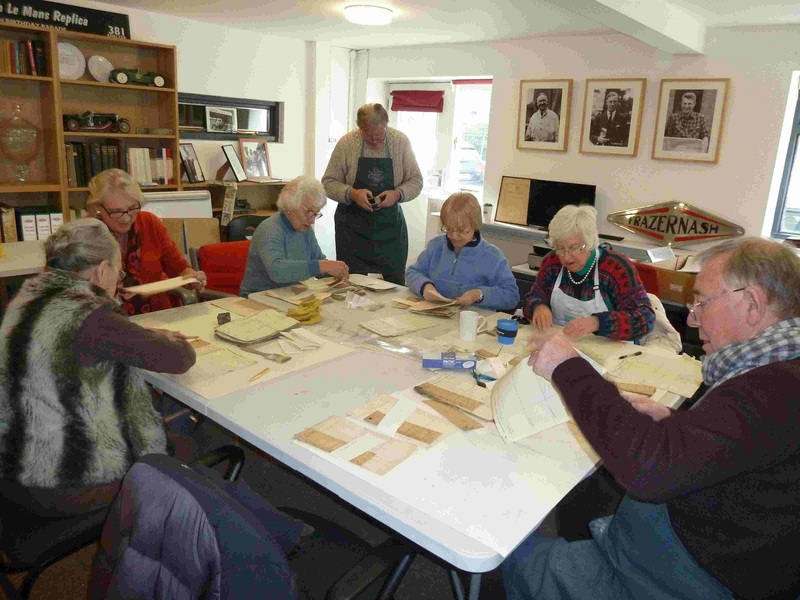 Progress in the task of archiving was steadily made in successive years by the trustees with voluntary help from Frazer Nash members and other enthusiasts, and the services of a professional conservator. However, it became clear that the mission of archiving such a large collection was beyond the capabilities of the trustees, most of whom live long distances from Henley. Fortunately, the promise of a solution came in 2016 in the form of contact with the Henley Arts Society (HAS), the local branch of the nationwide Arts Society (NADFAS as it was previously known). In addition to its lectures, study days and visits, the Arts Society undertakes wide-ranging cultural, educational and conservation activities with voluntary work done in museums, libraries and churches. The Henley branch, HAS, the second largest in the country, had just concluded a project recording the possessions of a local church whilst continuing their long term work on mediaeval book conservation in Oxford. Discussions with the local co-ordinator, Hugh Fitzwilliams, who had worked with the same group of people for some years, led to a pilot project involving the Kingston files, considered a priority for the Archives. This was immediately seen to be very successful and the HAS team became regular volunteer visitors, with two teams each of 4-6 people operating once a month. They have now completed a twelve month period and have embraced the job with great care and enthusiasm, and a degree of curiosity that has far outweighed any shortcomings of a lack of historic sports car knowledge. “Our first day at the Frazer Nash Archives was Monday 20th Nov 2017. In the last12 months we have put in a total of 440 man hours and attended on 22 days. The tasks we have undertaken and the overall working environment has been very different from the library world of Oxford Colleges but the challenge has been just as interesting, demanding and satisfying as the cleaning and conservation of 16th, 17th & 18th century books and manuscripts. Our first task was the cleaning and sorting of 1920s & 30s time cards from the Isleworth factory. The effects of languishing for decades in a damp and dirty roof space can be imagined, but the insight they gave to pay and hours for skilled labour in the 1920s & 30s was of real interest. Supplier correspondence and invoices of much the same period was the second task. Company names of a past age came flooding back but the real challenge was maintaining scrupulous accuracy and consistency as to date and correct alphabetical order (necessary for subsequent scanning and digitizing) especially when the same supplier seemed to operate under subtle variations in its title. The museum showroom was filled with long lines of tables and we volunteers, like an army of ants, moved from pile to pile inserting with care and diligence the right invoices in the right slot of the right pile!! My chief memory is that the showroom was very cold and we wasted little time in returning to the warmth of the ‘office’. Next came the fascinating job of reassembling the typed diaries of Archie Frazer Nash. These diaries, written and typed up on broadly a daily basis largely covered the war years of 1939 to the early 1950s and mainly referred to contact with the RAF and weapons specialists on the development and trials of gun turrets and the need for faster firing weaponry. Each ‘folder’ had been taken apart and scanned. Our role was to check all the pages were in the correct order and clip them back into the original covers using the original fasteners. The temptation was to read rather than reassemble! The latest focus of our work has been the cleaning, smoothing out the creases and listing by drawing number all the blue prints and drawings held in the archive ready for them to be scanned and thus preserved for posterity. This has been, and continues to be, a challenging task. The drawings come in very varied sizes from huge sheets bigger than A0 to snippets smaller than A4 and to complicate the process of holding them in number order, the small have to be interleaved but not lost between the large.